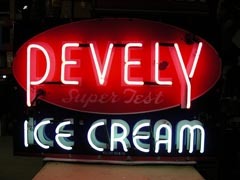 description: Pevely Super Test Ice Cream, single faced porcelain enameled neon sign manufactured by Keller Sign Company, St. Louis, Missouri. information: Pevely Dairy Company, St. Louis, MO., was founded in 1887 and soon became the leading producer of dairy products in the metropolitan area. Pevely was the primary supplier to the 1904 World’s Fair. Super Test was Pevely’s premium ice cream brand due to it’s high butterfat content and low overrun (amount of air within) both characteristics of a creamy-smooth and delicious ice cream.